‘Man flu’ is real, according to an exclusive trial carried out by pharmaphorum and based on a new methodology that could revolutionise research into some of the world’s most challenging diseases. Unlike many clinical trials, pharmaphorum’s trial involved only one male person with a particularly severe case of ‘man flu’ and used Bayesian mathematical principles to extrapolate results from the small sample population. The research involved measuring the single person’s patterns of sickness and comparing them to historical data that gave an insight to the “natural history” of the disease. Results were conclusive – that man flu is a real condition, caused by the male mind’s reaction to immune challenge, with symptoms including grumpiness, excessive complaining, and feelings of despair and hopelessness. The research also found ‘man flu’ had a detrimental effect on those around them with spouses and colleagues showing signs of irritation, exasperation and lack of sympathy. 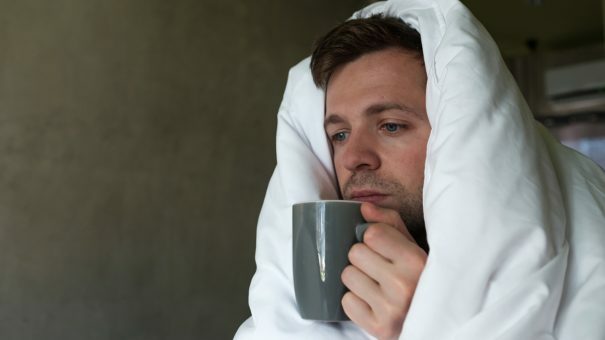 Paul Tunnah, CEO of pharmaphorum, and the world’s leading expert on man flu, called for further research into the phenomenon, to ensure that those infected receive lots of fuss and attention during severe flare-ups. He said: “After taking part in this ground-breaking and hugely important trial, I can say that man flu is real. Our trial shows that men are less well equipped to deal with the trauma of infection by common pathogens, such as various strains of the influenza and parainfluenza viruses. “More research is needed to demonstrate the burden of disease on those affected by ‘man flu’, and the devastating impact it can have on families and colleagues. Detailed results will be presented by Paul at the inaugural pharmaphorum Man Flu Summit, which will be held this month on the Russian island of Novaya Zemlya to prevent the disease from spreading any further, and to reduce the impact of the infection on the rest of the office.